President Trump to 60 Minutes: “I think something’s happening. Something’s changing and it’ll change back again,” he said. “I don’t think it’s a hoax. I think there’s probably a difference. But I don’t know that it’s manmade. I will say this: I don’t want to give trillions and trillions of dollars. I don’t want to lose millions and millions of jobs.” … “I’m not denying climate change,” he said in the interview. Richard Lindzen, an MIT climate scientist, said that believing CO2 controls the climate “is pretty close to believing in magic.” Climate Depot revealed the real way they find the “fingerprint” of CO2. In layman’s terms: All of the so-called ‘solutions’ to global warming are purely symbolic when it comes to climate. So, even if we actually faced a climate catastrophe and we had to rely on a UN climate agreement, we would all be doomed! Renowned Princeton Physicist Freeman Dyson: ‘I’m 100% Democrat and I like Obama. But he took the wrong side on climate issue, and the Republicans took the right side’ – An Obama supporter who describes himself as “100 per cent Democrat,” Dyson is disappointed that the President “chose the wrong side.” Increasing CO2 in the atmosphere does more good than harm, he argues, and humanity doesn’t face an existential crisis. ‘What has happened in the past 10 years is that the discrepancies between what’s observed and what’s predicted have become much stronger. Green Guru James Lovelock reverses belief in ‘global warming’: Now says ‘I’m not sure the whole thing isn’t crazy’ – Condemns green movement: ‘It’s a religion really, It’s totally unscientific’ – Lovelock rips scientists attempting to predict temperatures as ‘idiots’: “Anyone who tries to predict more than five to 10 years is a bit of an idiot, because so many things can change unexpectedly.” – Lovelock Featured in Climate Hustle – Watch Lovelock transform from climate fear promoter to climate doubter! The following is an excerpt from the new 2018 best-selling book, The Politically Incorrect Guide to Climate Change. UN IPCC chief Rajendra Pachauri admitted the IPCC is an arm of world governments and serves at their “beck and call.” “We are an intergovernmental body and we do what the governments of the world want us to do,” Pachauri told the Guardian in 2013. Morano: “The UN claims they were struggling with how bad to convey the allegedly ‘grim’ news about climate change. But what the media is not telling the public is these UN climate reports are self-serving reports that have predetermined outcomes. The UN hypes the climate ‘problem’ then puts itself in charge of the ‘solution.’ And the mainstream media goes along with such unmitigated nonsense. The UN even leaks their true motivation with these reports, calling for “rapid, far-reaching and unprecedented changes in all aspects of society. My new book details the many UN scientists who have resigned and turned against the UN. The UN IPCC has admitted these “solutions’ they are advocating for have nothing to do with science. Scientists are not impressed with this latest UN attempt this week to re-engineer every aspect of human life. The Associated Press’ Seth Borenstein has attempted to bolster the scientific credentials of the UN IPCC, Borenstein wrote on October 7: “The Nobel Prize-winning Intergovernmental Panel on Climate Change issued its gloomy report at a meeting in Incheon, South Korea.” But what Borenstein leaves out is that the UN IPCC won the Nobel PEACE Prize for political activism, not a Nobel scientific award. And there is a good reason why the UN IPCC won’t be winning any Nobel prizes for science. See below. UN issues yet another climate tipping point – Humans given only 12 more years to make ‘unprecedented changes in all aspects of society’ – But as the new book, “The Politically Incorrect Guide to Climate Change”, reveals, climate tipping points have a long history of repetition, moved deadlines and utter failure. The book documents that the earliest climate “tipping point” was issued in 1864 by MIT professor who warned of “climatic excess” unless humans changed their ways. UN scientist claims Trump ‘poses the single greatest threat’ to Earth’s climate – A former UN lead author of the United Nations climate reports, Dr. Michael Mann, has ramped up the stakes of the new “dire” UN climate change report by claiming the “latest [UN] report underscores the danger that [President] Donald Trump poses to the planet.” The UN report “makes clear we need to reduce emissions dramatically, vastly exceeding our Paris targets. Yet Trump probably poses the single greatest threat to meeting those targets,” Mann, a Penn State professor, told ThinkProgress on October 8. 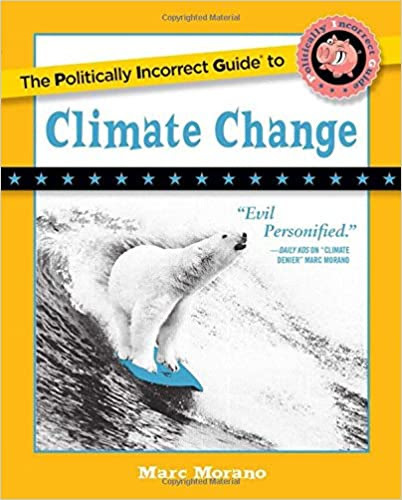 The new book, “The Politically Incorrect Guide to Climate Change”, reveals, climate tipping points have a long history of repetition, moved deadlines and utter failure. The book documents that the earliest climate “tipping point” was issued in 1864 by MIT professor who warned of “climatic excess” unless humans changed their ways. Book Excerpt – Bonus Chapter: Have We Advanced since the Middle Ages? EDITORS NOTE: The featured image is from WhiteHouse.gov.